This is the worst state welcome sign we’ve seen. It was hidden and didn’t say anything. It’s also the worst PICTURE of a state welcome sign. 27th state! Another sticker on the map! We stayed at Mustang Run RV Park. Notice anything unusual? Yes, that is a storm shelter next to our RV! That’s a new one. We checkout it out and learned it was stocked with waters, food and a couple chairs. We are in Tornado Alley but fortunately most of storms come through in the spring. The RV park has a nice clubhouse that we used for our classroom this week. The first two days were warm and sunny so we went for bike rides. We found a nice park, by a creek, to climb trees. We also rode to the Braum’s. We’ve never been to a Braum’s so we had to try it for lunch one day. It’s similar to a Diary Queen, but with better burgers and delicious shakes. The first Braum’s opened here in Oklahoma City in 1968. Read about the history here. It looked like it was under construction but we were able to go around to the west side and take a self guided tour of the interior. We had the place to ourselves, we did not see anyone else in the building. The interior was also under construction so we didn’t get to see the House and Senate rooms. Oklahoma has the only capitol with a working oil well on it’s property. The building was constructed in 1917 with a flat top and in 2002 they added the dome. The names of all the benefactors that contributed $1 Million+ are engraved in a ring around the dome. 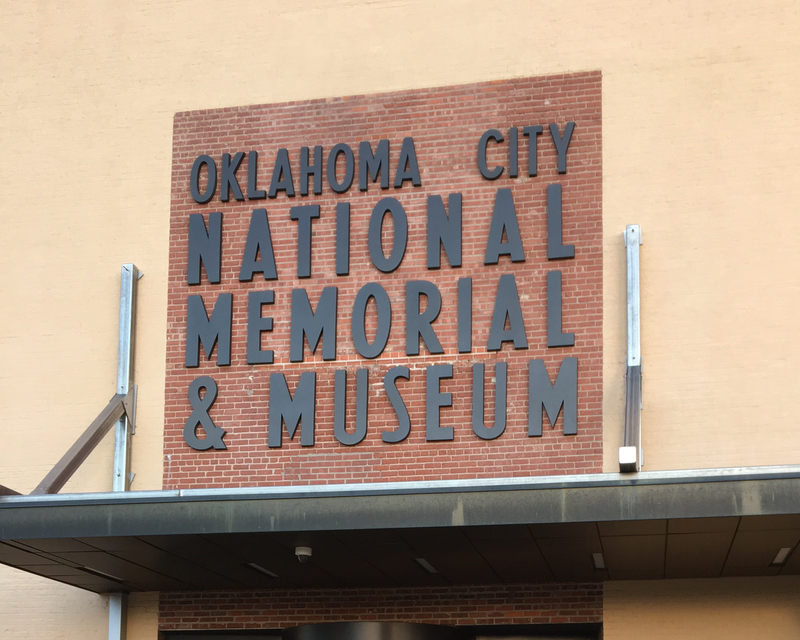 In October 1997, a wonderful memorial opened to honor the victims, survivors and all that were affected by the April 19, 1995 bombing of the Alfred P. Murrah Federal Building in Oklahoma City, OK. If you don’t recall the details about the bombing, feel free to research it but I don’t want to focus on the person that terrorized this city and nation but rather focus on the people that built a positive lasting memorial to remember the innocent and show how strong our nation is during times of tragedy. This attack is the deadliest domestic-based terrorist attack in the history of the United States since race riots. The outdoor memorial is run by the National Park Service so we stopped by to talk with a Park Ranger who pointed out a few things and gave the girls their Junior Ranger books. There are several individual segments within the one large memorial. ‘The Children’s Area’ showcases a sample of the 5,000 tiles sent from children from all over the US. The 100 year old American Elm Tree, that was in the parking lot of the building, survived. You can see the blackened bark from the cars that burned up beneath it. The memorial protects and showcases ‘The Survivor Tree’. We learned that they save the seedlings so they can replant them if this tree dies one day. In front of the Survivor Tree is the Rescuer’s Orchard. This tree grove represents the rescuers who aided the survivors. The 168 people that died are memorialized by 168 handcrafted bronze, glass and granite chairs. ‘The Field of Empty Chairs’ sit on the site of where the Murrah building once stood on 5th street between Robinson and Harvey. The Gates of Time stand on either end of the reflecting pool. The first gate has 9:01am engraved on it representing the last moments of peace. The other gate has 9:03am engraved on it, representing the moments of recovery and healing. The Reflecting Pool represents the moment the bomb went off at 9:02am. The Memorial Fence was part of the original fence that surrounded the disaster zone where people left small tokens of remembrances. They left part of the fence up as part of the memorial. They collect and catalog the items monthly and put them in storage. We left a small token in memory of the 16 children that lost their lives that day. They have over 28,000 Western and American Indian artifacts . They were preparing for a big Rodeo Hall of Fame event the day we were visiting. We saw a ‘small art’ auction exhibit with large price tags. We also saw a few Rodeo Hall of Famers and Queens gathering as we exited. The children’s room outside next to the gardens is a must stop. The purple plant pictured below is called an American beautyberry. I’d never seen one of these before but with my handy Plantsnap app I was able to identify it immediately. Iron Starr Urban Bar-B-Q is rated in the top 10 best BBQ in OKC. Chris thought it was the best brisket he’s ever had. I loved the green Chile corn bread muffins and the ribs.